Note that the unemployment rate increased sharply for all four categories in 2008 and into 2009. Unfortunately this data only goes back to 1992 and only includes one previous recession (the stock / tech bust in 2001). 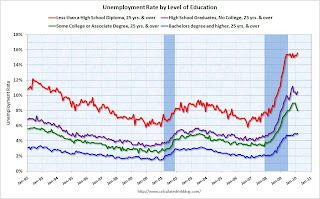 Clearly education matters with regards to the unemployment rate – but education didn’t seem to matter as far as the recovery rate in unemployment following the 2001 recession. All four groups recovered slowly. The recovery rates following the great recession might be different than following the 2001 recession. I’d expect the unemployment rate to fall faster for workers with higher levels of education, since their skills are more transferable, than for workers with less education. I’d also expect the unemployment rate for workers with lower levels of education to stay elevated longer in this “recovery” because there is no building boom this time. Just a guess and it isn’t happening so far … currently the unemployment rate for the highest educated group is still increasing.